TALIEFERRO ON NORTH ISLAND, 1913 Taliaferro was born in Campbell County Kentucky in December 1880. He enlisted in the Army with the express intent of eventually becoming an officer. He came to North Island in San Diego in 1913 after having spent some time previously in the Philippines surveying Luzon for the purposes of map making. He was assigned to the Army's aviation branch of the Signal Corps at Fort Sam Houston in Texas and was in the second unit to arrive at North Island when the Army decided to take over the unit (apparently because the Commanding General there got tired of having his troops buzzed by "those damn aviator's"..
TALIEFERRO SETS RECORDS Taliaferro set many records while stationed here. In January of 1914 for example, he flew from here to Elsinore, CA, a distance of 220 miles in 225 minutes, a feat carried on the front page of the San Diego Union. He was evidently also close to then 2nd Lt Ben Foulois who eventually became Chief Army Air Corp before retiring in 1932. Taliaferro and Foulois' wives were often seen at social events in town and were also passengers in the planes which their husbands flew (things have changed!). 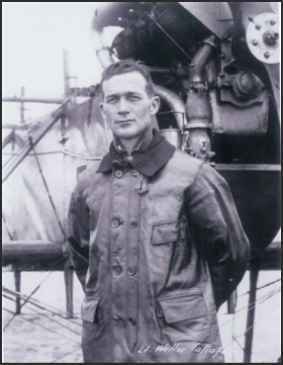 "At the time of his unfortunate death Lt. Taliaferro held the American record for sustained flight for a pilot alone - 9 hours and 48 minutes." [from the San Diego Union, October 17 1915, page 3]. So the relative value of the record setting was rather transitory except for Curtiss and the Wrights whose planes he was flying. (Taliaferro seemed to prefer Curtiss). Transcribed by Bob Davis - 2-26-07 "San Diego, Cal., Jan 20.- Lieut. W. R. Talliaferro of the army's first air corps flew continuously from San Diego to Pasadena and back to Elsinore, Riverside county, today. The distance covered, 260 miles, is believed to be an American record." 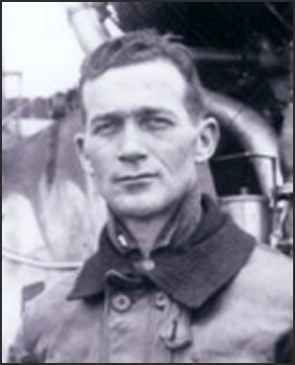 TALIEFERRO DIES IN CRASH, 1915 He was killed when doing the fortieth loop the loop made in Curtiss tractor #30. As best they could tell, he snapped the loop too quickly and it broke his neck. His plane went straight into the water of the ship channel at beacon/buoy #10. It took them more than 36 hours to find and bring his body to land where it had to be cut out of the wreckage. He was evidently idolized by his enlisted men who sent a floral arrangement in the shape of a Curtiss biplane. It was one of 400 flower arrangements sent to the funeral. He was buried here in San Diego at the Mount Hope Cemetery next to Major Sehon. According to report from USAF Historical Division "Taliaferro slid off the loop from an upside down position and crashed. Although damaged beyond repair, the engine had not crushed the pilot." ""Lt Taliaferro was crushed between the heavy motor and the back of the enclosed body."" CURTISS #30 Interesting side note - the plane, Curtiss #30, had sustained serious damage when "Lt Carberry was almost killed on Saturday, October 10, (1914). Curtiss J #30 dropped to the ground from 200 feet after its tail tipped up. The crash threw Carberry into the engine from the rear seat. The wide safety belt saved him from injuries more serious than minor contusions. The plane was seriously damaged. A board of investigation convened." One year and one day later Lt. Taliaferro would die in the same plane. EPILOGUE This is just a fast summary from memory and some preliminary research. Hope I haven't bored you with it. Geiger and Taliaferro sound like they were cut from the same cloth. PS - I'm originally from Bergenfield/Lakehurst. Via email from Michael Miller, 3-9-04 Additional on Taliaferro: Served as a private, corporal and sergeant in the One Hundred and Tenth Coast Artillery from 09/12/01 to 09/02/08. Made Second Lieutenant in 21st Infantry on 08/02/08. On 09/17/15 (about a month before he died in the crash) he broke the American sustained flight record for pilot alone by remaining aloft 9 hours and 48 minutes. Would have remained aloft longer but developed a fuel leak. from the San Diego Union (and Daily Bee) of October 12, 1915. THE SAN DIEGO UNION By clicking on the title above, you will access the complete story of the events surrounding the crash as reported in the San Diego Union newspaper of October 2, 1915. The story is extended, comprehensive and offers two illustrations which were found in the original article whch was preserved on microfiche. My thanks to Michael Miller for researching, copying and making the article available to us. ONLINE RESOURCES If you search on "Walter R. Taliaferro" using Google, (3-4-04), you will find about 14 links, most of which simply refer to the fact the "Camp Taliaferro" was named for an aviator who died in a crash. There is an occasional mention of the 21st Infantry in the same article. THE SAN DIEGO UNION By clicking on the title above, you will access the complete story of the funeral which was held on Saturday, October 16, 1915. My thanks to Michael Miller for researching, copying and making the article available to us. via email from Michael Miller, 3-21-04 Lucien H Taliaferro, (Walter's brother), was listed in the 1920 census with wife Alma C (or maybe E) and son Walter R, named for his brother. They are living in the Cablenz barracks in Germany where Lucien is a Lt Col. By 1930, Alma has married William Robids, and has Walter and Lucien C. Jr living with them. The website of the Taliaferro collection includes an obit that says he dies after '46, [see below] so I'm assuming they divorced. Obituary of Col. Lucien H. Taliaferro. Sometime after 1946 as his retirement from the service in 1946 is included in obituary. Possibly 1952 or 1956 as small part of an article visible on back of obituary concerning elections refers to someone as an Ike man (supporter of the presidential candidacy of Dwight Eisenhower).